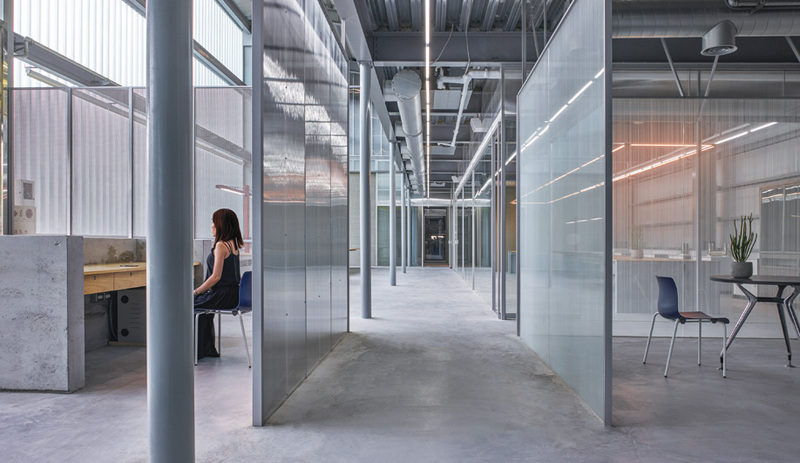 In a neighbourhood known for its juxtapositions of factories and fashionable hangouts, New York’s HWKN creates a complex out of two eight-storey halves with staggered floor plates. 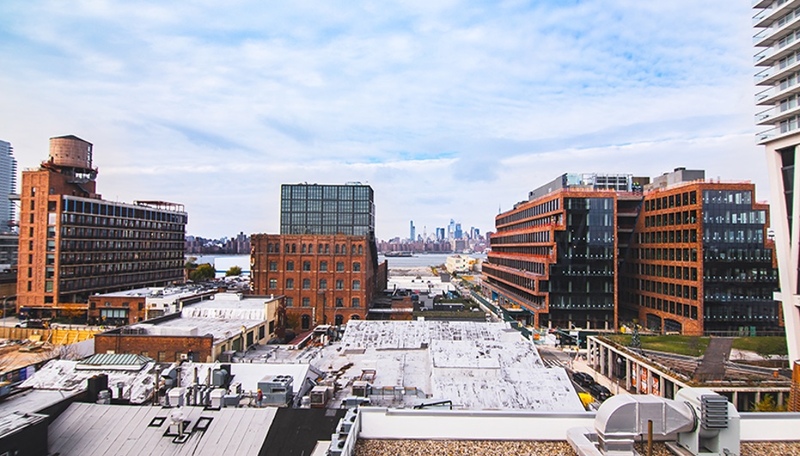 In the rapidly gentrifying New York City neighbourhood of Williamsburg, shiny new developments are rising cheek to cheek with older industrial warehouses and shipyards caught up in the wave of renewal. With a few formal gestures, New York firm HWKN’s latest project – set to open later this spring – strikes a perfect balance between the district’s past and future, scaled to be a good companion to all its neighbours. 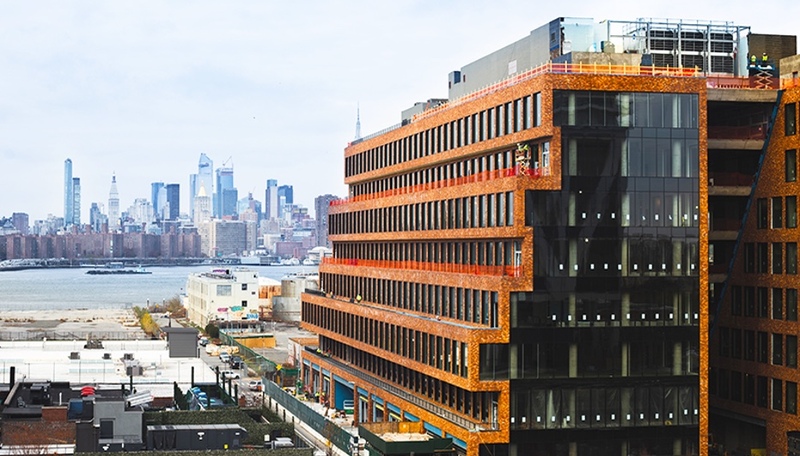 Brooklyn’s first speculative office property since WWII, 25 Kent was conceived as a campus and workspace for tech entrepreneurs. 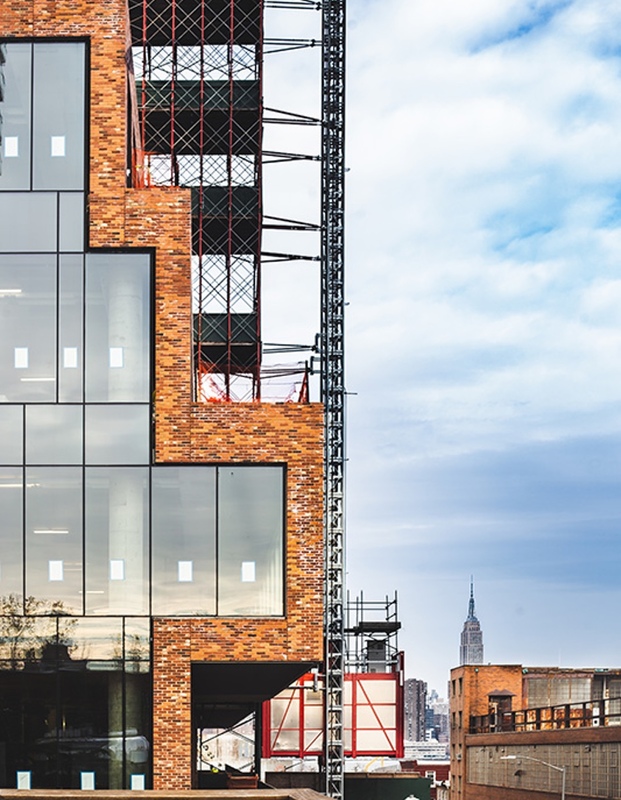 The 46,500-square-metre complex occupies a full city block near Bushwick Inlet, just metres from the East River; its neighbours range from cocktail lounges and boutique hotels with upscale dining to shipping yards and (just next door) a metal hardware factory. With both a jumble of typologies and a rapidly changing skyline to contend with, HWKN faced the question of how to create a hub that could serve as an attractor to the surrounding community when that community is in flux. 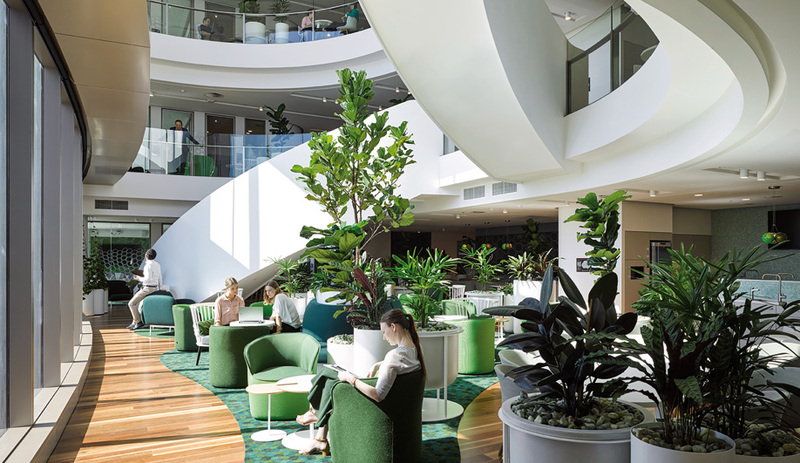 The team’s answer came in the form of a unique building shape, which HWKN developed in collaboration with design development architect Gensler. 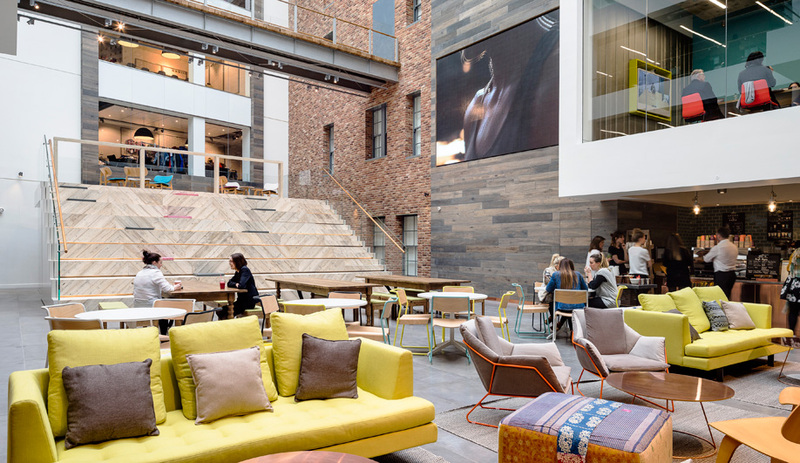 The bulk of the interior space is divided between a pair of eight-storey halves: two long, narrow volumes that run the length of the site, parallel to one another, but offset so that one juts out further than the other at opposite ends, where they shelter a pair of outdoor plazas. The widths of the towers’ floor plates are arbitrarily staggered so that the long, street-facing facades jut in and out to form a series of brick-clad balconies, which visually divides the towers into strata that match their industrial neighbours in both scale and material. On their short ends, these volumes are capped with floor-to-ceiling glazing, offering exceptional views northwest to the river and Manhattan beyond it, and southwest to the Brooklyn skyline. 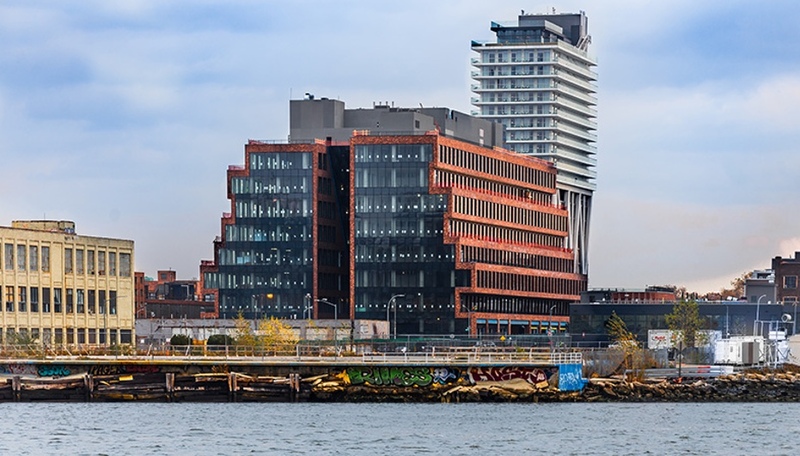 At ground level, the two towers are separated by a retail-lined pedestrian passageway that connects the plazas at either end, channeling traffic into the heart of the campus and improving the neighbourhood’s access to the newly refurbished Bushwick Inlet Park. The separation of the two halves isn’t total, however; they’re joined by a series of glass-walled hyphens that grow wider as they go up, establishing a V-shaped connection between the two masses. 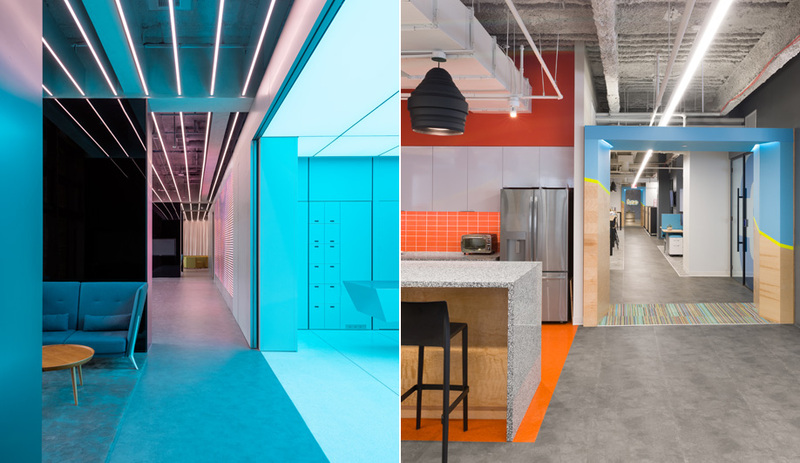 Inside, the resulting H-shaped floor plans are wide open, customizable to large companies occupying entire floors or to smaller startups looking for an interconnected space that will foster collaboration and chance encounters.